This is Midge patiently awaiting her turn. Tell me about how you got started in the grooming business? I needed a job when I was 18 and my mom mentioned that PetSmart was hiring. So when I went to apply, they had several job options: Cashier, aquatics, Reptiles, Dog Bather... So I checked "Dog Bather" on a whim because it seemed fun. I didn't have dogs growing up and I knew nothing about dogs. Then after a year or two of bathing dogs (at PetSmart and other shops), I slowly started to learn to groom. On and off for about 17 years. I'm also an actress/comedian, so I also waited tables in NYC and LA for about 6 years. Working at a grooming shop for 5 years, I kept having to leave for auditions. I finally realized that I needed to work from home. So I converted my garage into a grooming studio, which allowed more time for acting. I had no idea that it would become so popular! How did you come up with the idea of producing artful videos? It just kinda happened. I was blow drying a dog and her ears flew up and I grabbed my phone to take a video. Then I got a new iPhone and started doing slo-mo videos. Then a friend told me about an app that puts music to the videos. I got so inspired and it was so much fun! 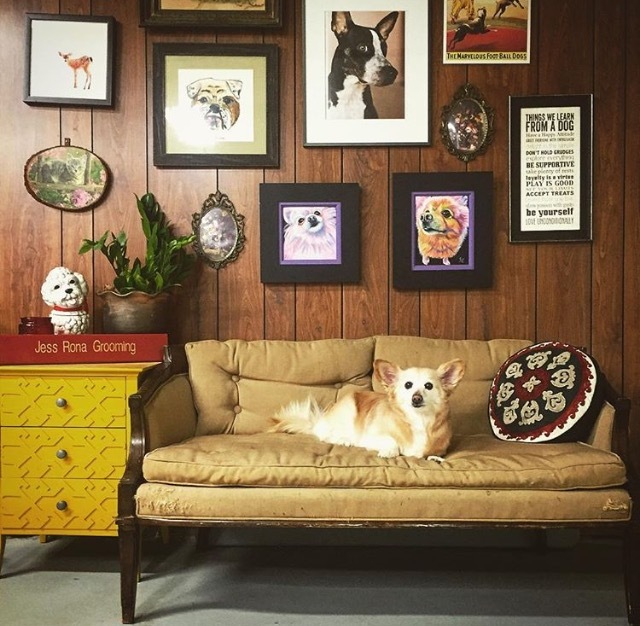 Are many of your clients dogs celebrities' dogs? All my clients are celebrities! Do you see yourself making a TV show out of the screen videos? I got some funny friends together and shot a web series about being a groomer in LA that's totally improvised. It's in the editing phase, so stay tuned! I also write funny songs, and recently I shamelessly plugged my new music video on my Instagram." Tell me what's next in your life? A book, a product line and an at-home bathing kit to sell to the masses! Also, maybe I’ll make a funny show! How many dogs do you have and what are their names and breeds? I have two incredible beasts. Chupie is a "Sato" (a Puerto Rican street dog) that my husband brought home from Puerto Rico. I think she's a Boston Terrier/Shepherd/Pitt mix, and Meemu is another street mutt (who is a poodle mix) from San Bernardino.